Four Reasons To Attend... 1)	Centrally Located in Concord/Charlotte area at a Great Hotel 2)	Fantastic Educational Lineup - 24+ Credits 3)	Practical & Engaging Workshops 4)	Plenty of Fun for the Family! 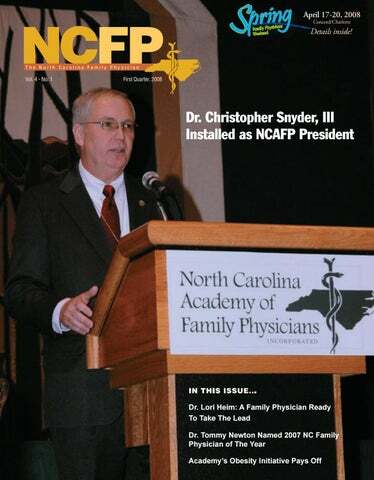 The mission of the North Carolina Academy of Family Physicians is to improve the health of patients, families, and communities by serving the needs of family physicians with professionalism and creativity. Strategic Objectives 1. Health Promotion & Disease Prevention (Health of the Public) – Assume a leadership role in improving the health of North Carolina’s citizens by becoming proactive in health promotion, disease prevention, chronic disease management and collaborating in other public health strategies. 2. Advocacy – Shape healthcare policy through interactions with government, the public, business, and the healthcare industry. 3. Workforce – Ensure a workforce of Family Physicians which is sufficient to meet the needs of patients and communities in NC. 4. Education – Assure high-quality, innovative education for family physicians, residents, and medical students that embodies the art, science, and socioeconomics of family medicine. 5. Technology & Practice Enhancement – Strengthen members’ abilities to manage their practices, maintain satisfying careers, and balance personal and professional responsibilities. 6. Research – Develop and promote new medical knowledge and innovative practice strategies through information technology, primary care research and assessment of the practice environment. 7. Communications – Promote the unique role and value of family medicine, family physicians and the NCAFP to the public, business, government, the healthcare industry, and NCAFP members. must continue to focus our energy and resources on the politics that invade the health care system.” - Dr. Christopher Snyder, III know, several health insurance plans unilaterally instituted a prior authorization plan for imaging studies and shoved it down our throats. They introduced it with the usual rhetoric, saying it will reduce costs, improve patient safety, and will really only affect those who are abusing the system. Our Academy performed a survey of our members and found it took at least the amount of time for two office-visits every day and added about $10,000.00 a year to your office overhead, not to mention the aggravation of having someone in Minnesota making decisions for our patients in North Carolina. Our Academy contested these handcuffs with our usual weapons: solid reason, hard facts, and common sense. Our efforts were to no avail. It seemed to be just another example of how big business has the contractual upper hand and another example of the fact that we were powerless to do anything other than complain and comply. 2008 Spring Family Physicians Weekend Promises To Please April 17-20, 2008 in Concord, North Carolina The Academy’s Spring Family Physicians Weekend is heading to Concord/Charlotte, NC on April 1720, 2008. Dr. James McNabb has prepared an outstanding program full of engaging topics, pertinent skills workshops and entertainment that everyone will enjoy! The meeting officially begins on Thursday, April 17, 2008 at 4:00 pm. General session lectures start Friday morning and conclude Sunday just before noon. This format offers physicians the flexibility of a near complete workweek and the opportunity to obtain over 20-plus Category I credits - several of which may offer evidence-based credit. Attendees will also be able to take advantage of several workshops, including one on joint injections, substance abuse, coding, and even a presentation on adding cosmetic procedures as a value-added service. A Family Physician Ready To Take The Lead Dr. Lori Heim Campaigns for AAFP President-Elect AAFP Board Director and new North Carolina resident Dr. Lori Heim of Vass recently announced her candidacy for AAFP President-Elect. To provide members insight into her leadership philosophy and her perspectives on the specialty and what’s needed at the national level, The North Carolina Family Physician asked her to share her thoughts on a number of key questions. Answers to the first of these appears below, with the remainder to follow in the April issue. at what prevents the patient from getting the treatment they need, what hinders the physician, nurse, etc., from being safe and effective. When looking at small practices, it is more difficult to get some of the efficiencies I enjoyed in a larger group, but it has the advantages of being more nimble. There is less bureaucracy and barriers to some change, but the profit margin drives many of the barriers. What are the biggest challenges you see facing the specialty in the next 24 months. 14 third-year family medicine residents were named Outstanding Residents by their programs. After thirty-one years promoting family medicine across North Carolina, Sue L. Makey, CAE, was recognized with the chapter’s Lifetime Service Award upon her retirement. Sue is the first non-physician to be honored with the award since its creation by the association in 1999. The chapter celebrated her lifetime contributions with a retirement gala on Friday, Nov. 30. Each medical school recognizes doctors dedicated to teaching medical students about family medicine. Numerous family medicine dignitaries were in Asheville for the 2007 Winter Family Physicians Weekend in early December, including twenty-six past presidents of the NCAFP. Duke University	East Carolina	UNC-Chapel Hill	Wake Forest Univ. 95% Collection Guarantee! We guarantee that you will receive the revenue you’ve earned with MAG Mutual Healthcare Solutions, Inc.’s (MMHSI) Physician Billing Service. After we receive your contracted fee schedules, we’ll GUARANTEE an annual net collections rate* of 95% or better or we’ll provide a 5% invoice credit on the annual fees you paid to us. Call toll-free today at 1-888-249-7876 for more details. The annual net collection rate is the total amount paid to the practice, plus contractual adjustments, divided by the total gross charges billed for one year. A fee credit, if due, will be applied to your MMHSI billing invoice upon completion of 12 months of service. Please call for details. Guarantee effective for new billing service clients through 12/31/07, upon receipt and evaluation of the practice’s contracted fee schedules. Dr. Newton’s Fitness Renaissance Program holds a special place in the hearts of youngsters in Sampson County. Medals motivate kids to continually improve and strive every nine weeks. with the chapter and shows no sign of letting up. If this weren’t enough, Newton has also served the Clinton community with distinction. He’s been a role model and volunteer leader at Clinton High School, held numerous positions on community organizations, and most recently, played a major role in helping the city win the national All American City Award (AACA). The centerpiece of AACA was Clinton’s Fitness Renaissance Program, a project Newton created with the help of his local school system. This program has become a nationally-recognized way to tackle childhood obesity. What makes the program unique is that it drives children to focus on short-term goals and is highly individualized. This incentivizes them to participate and strive to improve all year long. “Human nature tells us shortterm goals make you strive harder versus longer-term ones,” he said. To date, the program has impacted over 1,400 children in Sampson County. Newton takes special privilege in noting its effectiveness. “What’s beautiful about this program is that everybody has the same opportunity to get an award. And the looks on the kids’ faces when they do speaks for itself,” he said. Newton resides in Clinton with Annette, his wife of thirty years, and has three grown children. For complete information about this program, including applications and directions on how to apply, please see your medical school’s Family Medicine Department. WakeMed Pediatric Diabetes Program for their community-based intensive education and lifestyle change program. Dr. Skinner is thankful to have this collaboration to continue to tie her own obesity prevention to a larger community effort and to continue to draw upon the physician referral model. Results from Fit Together East Carolina University researchers reviewed the results of 19 childhood obesity grant projects funded by the NC Health and Wellness Trust Fund. ECU researchers looked at 1,346 children from 4 to 18 years-old who were grouped into one of four categories when the projects began: underweight, healthy weight, overweight and obese. Using approaches such as nutrition lessons that encourage less sweet beverage consumption, 90% of the children stayed in their previous weight category or improved over the three years of study. Among overweight and obese children in the study, 51 percent improved their weight category. For some, improving their weight category meant they actually lost weight. For others, it meant they grew taller while maintaining their weight. Some did both. NCAFP Member Physicians Participating in the Cohort Study The NCAFP would like to thank the following physicians for recruiting their patients to participate in the cohort study: Mary Digel, MD, Maureen Murphy, MD, Mott P. Blair, IV, MD, Al Hawks, MD, Colin Jones, MD, Karen L. Smith, MD, Susan Snider, MD, Bill Carr, MD, J. Thomas Newton, MD, William Dennis, MD and Elizabeth Gibbons, MD. All together they collected data on 109 patients! Other physicians who participated in the project by working with their local Extension Agent included: Suzanne Landis, MD, Shannon Dowler, MD, Christopher (Reb) Snyder, III, MD, Tamara Babb, MD, Peter Jacobi, MD, Woody Warburton, MD, and Belinda McPherson, MD. Many materials available in both English and Spanish! Shipping charges apply. If you work in a health care setting . . .
You are likely to be exposed to ﬂu at work. If you donʼt get ﬂu vaccine, you can catch the ﬂu and become very sick. The ﬂu is a lot worse than a cold. You can spread the ﬂu even before you feel sick. Your family and friends could become seriously ill, especially babies and older adults. Likewise, your family and friends could miss days of school or work. If you are under 50 and are not pregnant, you can get the nasal-spray vaccine instead of a shot. However, do not get the nasal-spray vaccine if you have a chronic disease like asthma or diabetes, or work in a hospital isolation unit. Have questions? Visit www.immunizenc.com or call the Centers for Disease Control and Prevention Hotline: 1-800-CDC-INFO 1-800-232-4636.
to analyze their own performance and documentation so that they can ready themselves for any opportunities that may come with financial incentives for reporting this data later. Some thoughts to get you started: 1. Don’t wait. Start thinking about what tools you have in your practice today that can produce data for you. Most practices have some ability to generate electronic data that can be queried to provide information about the practice, the patient population and the services provided. 2. Learn your systems. Think of how you can use the systems you have to learn more about your practice. Most practices have a practice management system (PMS) that can provide an enormous amount of data regarding your patient population, scheduling habits, no show rates, etc. In addition, providers either have or contract with a billing system that can provide insight into the practice, including diagnosis codes, revenue generation, and payer mix. At the least, you could consider using a paper flowsheet in your chart to guide your care. At the end of each day, have a staff member enter the information from those flowsheets into an Excel spreadsheet to get an idea of the quality of care that you provide to those specified conditions. These flowsheets are available from a multitude of sources, including your Community Care of North Carolina Network. In closing, there is a wealth of information in any physician practice; you just need to be creative in where to look and how to get the data. As we approach an era of public reporting and pay for performance, take the time now to look at your own internal data and improve to your highest potential. The more effort that is put in now to know your practice and to measure and improve quality and efficiency, the more potential you will have for improved satisfaction and financial reward to come your way in the long run. Would you give a dollar a day for the chance to have a medical student in your office so they can make a career choice with their heart and not their wallet? Would you give one dollar a day to send Dr. Heim to the AAFP and bring honor to North Carolina and our Academy? 2008 is a leap year; I don’t want you to think we are taking advantage of you during a leap year; if you will give a dollar a day for 2008, I will cover Feb. 29th for each of you! Now is your chance to hurt me where it hurts the most. If you can’t give a daily dollar, please give what you can; we will do our best to see that it is returned to your pocket many times over. Not everything that can be faced can be changed, but nothing can be changed until it is faced. We will never change what we tolerate, and we have tolerated our situation too long. Obstacles are those frightening things you see when you take your eyes off your goals. Your Academy has the goal of payment reform through political action clearly in sight and has the tools to overcome all obstacles. Those of you who know me well know how fond I am of public speaking; I asked a friend and mentor of mine about what to say; he said that speeches were not about having all the answers, but about creating hope. I hope that I have reassured you that the NCAFP remains in dedicated and capable hands. I hope that I have convinced you that your Academy will work to achieve the relief, reform, and respect we deserve; to work for real solutions for the real world, solutions that will preserve our medical homes in North Carolina. I hope I have enlisted your help in your Academy’s goal to complete a winning campaign for Dr. Lori Heim in 2008 as President-Elect of the AAFP and to continue North Carolina’s legacy of sending excellent leadership to the AAFP. In 366 days I will stand before you at this podium and be judged by you. I hope I will have lived up to the responsibilities of this office and the trust you have placed in me. And, I hope you will agree with me that these are certainly “optimistic, exciting and interesting times.” Thank you for this wonderful opportunity. God bless each of you. Thank you.